Located in the heart of Athens as well as within walking distance of exclusive shopping areas and museums, the Hotel Grande Bretagne enjoys the ideal location in the city centre. This eight story 19th-century building exudes wealth and refinement from the first impression while it has been repeatedly awarded by significant international communities. 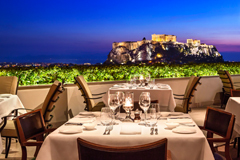 The renowned Acropolis is located within walking distance of 1.0 km from the Hotel Grande Bretagne; Plaka is the old historical neighborhood of Athens clustered around the northern and eastern slopes of the Acropolis. The "Monastiraki Flea Market" is the place where the utmost hand-made selection of souvenirs can be observed. With meticulous attention to detail, the 320 rooms and suites marry charming old-world elegance with state-of-the-art facilities whereas the 58 suites enjoy additional benefits including personalised Butler Service. All of the beautifully appointed accom - mo dations capture the essence of gra - cious hos pitality with nightly turn down service, shoe shine service, well-stocked refresh ment centers, indulgent bath - room toiletries, pure cot ton bath robes, plush slippers and ref resh ing bottles of water. The hotel also offers valet laundry service, 24-hour room service, while our dedicated Concierge team members stand ready to be of service seven days a week, 24 hours a day. Guests can indulge themselves within the multi-awarded GB Spa as well as experience the utmost dining service within the GB Roof Garden which is ideal for a romantic rooftop meal, the Winter Garden which is renowned for its afternoon high tea or even the GB Pool Bar & Grill during the summer season. The awarded Alexander’s Bar is where guests may linger over a classic cocktail or exquisite cognac and the Alexander’s Cigar Lounge is the utmost relaxed setting to enjoy premium cigars, cognacs and liquors. 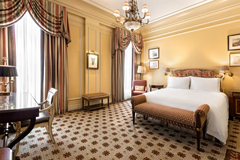 The Hotel Grande Bretagne is the ultimate choice for refined business meet ings and lavish social events. Featuring over 1,100 square meters of exquisite function space, the hotel offers the Grand Ballroom, Golden Room, Royal Room, Athenian Hall and its smaller meeting rooms: Boardroom, Churchill’s, Chair man’s, Diplomat’s, and the Exe cutive Room. Right next to Hotel Grande Bretagne, stands its sister property, King George, Athens, a historic residence featuring the enchanting Ballroom which can be customized for anything from weddings and banquets to lectures and seminars.